View from the Trail, 12" x 12"
Lori Woodward Simmons, a published author and watercolorist splits her time between the coasts, painting plein air, writing and teaching workshops. She works in watercolor because of their ease for plein air and their drying time. A palette filled with pigment, half a dozen sheets of cold press paper, water and her two brushes all fit snuggly in a backpack for a trek out to the desserts of Arizona or the hillsides of New Hampshire. Lori’s choice in brushes stems from the qualities that she needs as a watercolorist. She uses only two brushes, a round number six Kolinsky sable and a synthetic number 2. She says that with a Kolinsky sable, the brush will hold water and pigment better than a synthetic. Applying the brush to the paper, the paint will be released in a stream; the more pressure applied, the more paint is released from the hairs. The Kolinsky also holds a fine point so Lori can use the round for a range of textures and washes in her work. The smaller synthetic number 2 is used for fine lines and details, giving Lori’s work the depth and realism many artists long for. 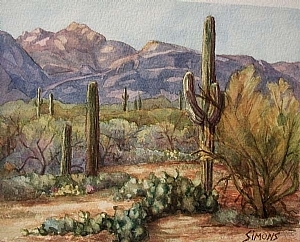 Besides working in her own studio and plein air, she is a published author for several national art magazines as well as co-authored the book “Watercolor Step by Step”. Cathedral Peak, 8" x 10"
She paints with the Putney Painters, mentored by Richard Schmid and Nancy Guzik and teaches her own workshops. To find out more about Lori and her work, you may visit her website: http://loriwords.com/works. What is a Sable Brush?